Whoa! I got snacks, fragrance samples, a hair product, and makeup all in one package. Those are literally all my favorite things, so it's safe to say that I was pretty pleased when I opened this up. Also, the box itself is adorable! I'm a sucker for bomb packaging. Okay, so let's start with the snacks because who doesn't love to eat? The Aloha Peanut Butter & Jelly Protein Bar was heaven sent. I like keeping small snacks in my purse "just in case," so this fit right in with all my other stuff. It was super tasty, too. Have you guys ever tried Evolution Fresh Cold Pressed Juice? If you haven't, you're truly missing out. It's really good and good for you! Thank you Influenster for the coupon. I will surely be grabbing my free bottle at some point this week. Hello Vera Wang! I received two fragrance samples from her "Embrace" collection, in "Green Tea and Pear Blossom" and "Marigold and Gardenia". I greatly enjoy smelling like a flower, so these are wonderful additions to my fragrance collection. I'm most excited to try this foundation by Covergirl. It is the Vitalist Healthy Elixir Foundation in the shade 760. It may actually be a tad too dark for me, but maybe I can use it to contour. *shrugs* I haven't used it yet because the bottle is simply too pretty and I don't want to ruin it, but I promise to report back once I do. This last product is for hair; the Mane Magic 10-In-1 Primer by Eva NYC. This a multi-use serum is packed with super good ingredients, such as argan oil and sunflower seed oil. It can be used on all hair types, so I'm pretty excited about putting this on my curls. I also got a coupon for $2.00 off, for when I run out and need more. Oh, and it smells amazing! So, the moment you've all been waiting for! Here are the deets on Influenster. It's free program that allows you to earn products in exchange for honest reviews on products you've already used. Yes, all you have to do is sign up, review, and the goods start rolling in. Participating in "snaps," virtual campaigns and inviting your friends to join increases your chance of earning a VoxBox. Sounds easy, right? Click here to sign up. I'd like to personally thank my friend and fellow blogger boo Erika for putting me on to this. Visit her blog here, she's got a really dope style! 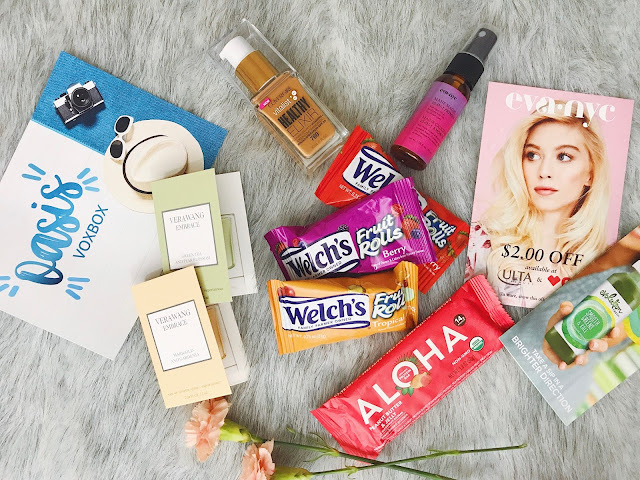 Influenster is really a great program for many ladies especially to buy different products on sale and can explore many new things about them. great share!